There is something about wearing boots during the summer that gives your outfit a unique spin. I bought these right before I left for Texas last week and they have the perfect rustic feel. Don't be afraid to pair a more manly dirty boot with a feminine outfit. My skirt and top are pretty and delicate and I like that the boots make the outfit more casual and funky. Just by adding something small and different can really make your outfit stand out without making you look like you are trying too hard. I wore this outfit for a light lunch and shopping with my girlfriend and then snuggled into my fair isle sweater to keep me toasty at a late night movie. 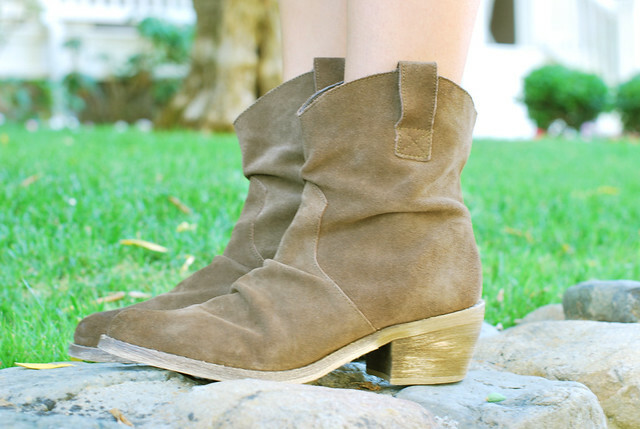 Ankle boots are so in this season! L O V E your skirt...so girly! hey cutie, I love your skirt, great color. I definitely love how you combined feminine pieces with a more rustic option on your feet. :) Great combo. Love the lace top and the yellow! :)...gorgeous. thats a supercute outfit! and i love the boots! I love the last picture! I like how the boots balance out the feminine appearance of the outfit too. Oh, how pretty your lacy top is! Love the color of the skirt too! I'm inspired to wear boots that way this weekend! super super cute shirt and skirt!! Thanks ladies! They are my new fav pair of shoes! You look adorable here, I love these things paired together! ooooooo i love the boots and you always look lovely in yelloW! Love the very girly outfit with the rough boots -- very cool combo. Love it! I'm all about boots and skirts/dresses too! You look fab. love that look! boots are fantastic! kiss! LOVE the lace and yellow! Sucha fun combo! Such a cute look, I love the yellow skirt! Gorgeous lady! You look stunning in yellow and lace! Love how you paired this outfit with the brown boots, unexpected and fun! Summer boots definitely give every outfit a great and unique feel. Your ones are amazing. I also love your top. I love the yellow skirt. This outfit looks great together. You are gorgeous. Thank you guys so much! Reading your comments makes my day! hımm you look so cool and love your skirt color & boot style. I love the lace paired with the boots. It is so unexpected and flattering. I totally agree, it looks effortless.I am going to Texas in November and I wnat to start collecting some key pieces like these. You look lovely in this outfit and I love the yellow! Very pretty and what a fun blog! Your so pretty, love the skirt. Love this outfit, the tan boots just go so well with the yellow skirt! I'm always hesitant to put on boots in summer, but this totally works.